A man has confessed to strangling or suffocating 23 men during an eight-year killing spree and dumping their bodies in remote spots, police said. Ronald J. Dominique, 42, was charged with nine additional counts of murder on Monday, bringing the total to 11 counts against him — 10 for first-degree murder and one for second-degree murder. "He stated how, when and where they were killed," Larpenter said. All of the victims were men, most of them homeless, reports Dave Cohen of CBS radio affiliate WWL-AM (audio). Their bodies were found dumped in remote suburban and rural areas outside New Orleans. "His MO (modus operandi or method of operation) matched every victim out there," Larpenter said. "The description that he gave, he wasn't a police officer, he puts himself where he dumped at dump sites, so we know for a fact from his confession that it was adequate, accurate and direct." Joseph Waitz, the parish's district attorney, said his office will seek the death penalty against Dominique, who was being held Monday in Terrebonne Parish jail. Dominique, who is indigent, has not yet been appointed a lawyer and did not have one present during questioning. Sheriff's officials say the confession is solid and that Dominique supplied details that had not been released and that only the killer and investigators would know. Authorities are investigating his claims and more charges are possible. 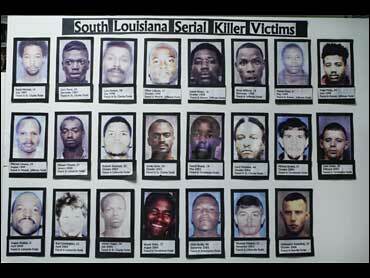 The victims' bodies were found in seven different south Louisiana parishes. All were found bound and had been killed in similar fashion, Larpenter said, leading investigators to suspect the work of a serial killer. Larpenter said the biggest break in the case came within the past year, when a man told authorities Dominique had attacked him. Family members of victims gathered outside the Houma building where authorities held Monday's news conference. "It hurts a lot, knowing that this man did this to my kid and other kids," said Veronica Guidry, the mother of victim Nicholas Pellegrin. Jodie LeBouef, the sister of victim Nicholas Pellegrin, cried and held pictures of her brother. Dominique has not been charged with his death. "I'm glad they got him. I hope he gets the death penalty," LeBouef said. "My brother didn't deserve for anything to happen to him. My brother would do anything for anybody."